So, the inker has done his or her job, and now we have black and white images—usually with some halftone rendering, like feathering, hatching, stippling, drybrush, maybe even spatter technique. And even possibly with some Zip-a-Tone or other halftone applique, creating gray or grayish areas. At this point, the colorist controls everything but the black and grayed areas. They’re there. The colorist can choose to leave a white area white or choose to fill it with any color. In ancient days, there were only 56-58 usable colors. There were three color plates—yellow, magenta and cyan. You could have no color in an area, 25% or 50% halftone of each color, or solid colors. That works out to 64 theoretically possible colors, trust me. But some weren’t really usable because the ink saturation would have been too heavy for the cheap newsprint paper. Show-through is bad enough, soak-through is disastrous. JayJay, expert printing/production person, here you are welcome to add technical printing/production foofarah if you like. Let’s talk about the ancient days for a minute. The technology has improved, there is much more a colorist can do now, but many of the old principles still apply, or are instructive. If you look at ancient comics, I’m talking Golden Age through the early 1980’s—and especially the earlier ones, when, in my opinion, more colorists had a clue—you’ll notice certain patterns. Ever notice that to this day, heroes tend to be dressed in primary colors? Red, blue, yellow? Villains tend to be wearing secondaries. Orange, green, purple. Civilians tended to be wearing other dark colors—Prussian blue, magenta, brown, blue-green…. Colorists colored the main characters dark. They colored the backgrounds pastels. 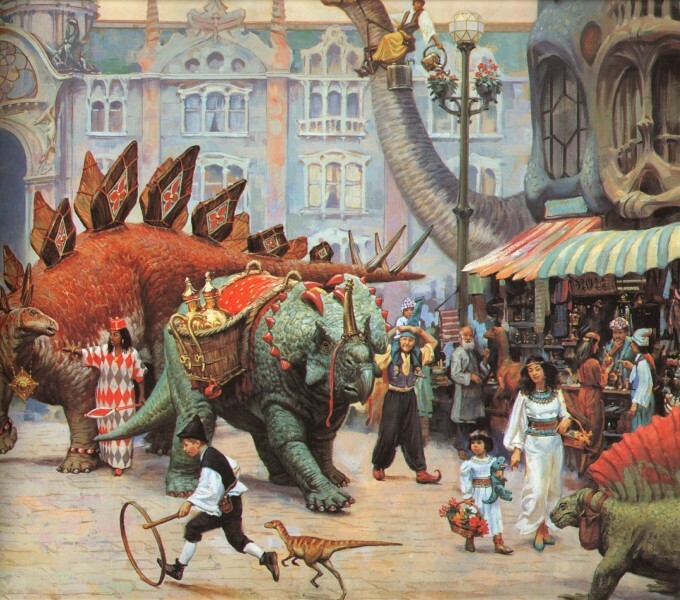 The main characters were usually in the foreground. They stood out. Instant depth. Dark foreground elements, light background elements, the most common value progression, dark/bold to light/pale. Bingo. No it wasn’t done every single time in every single book in every single instance. Sometimes a new person screwed up. Sometimes an experienced person dared to try variations. A pink dress on a woman. But check it out, don’t you see a lot of primaries heroes and secondaries villains? I’m not talking through my hat, here. This is what I was taught in the 1960’s. In modern times, the coloring is done like a painting, usually on a computer—some still use real paint and brushes—but either way, there are unlimited colors at the colorist’s disposal. But still, the same underlying principle applies. THE JOB IS TO CREATE DEPTH, THE KEY TO CLARITY. No rules. In these advanced times, you don’t have to do pastel backgrounds and characters’ colors according to formulae. But, still, you should be trying to create depth. Clarity. The colorist has more tools to use than the inker does. He or she can create depth progressions with all the properties of color—hue, intensity and value, and of course, playing with plane-by-plane contrasts of same. Marie Severin, wonderful, lovely genius artist, colorist, creator, used to teach the use of “hot” and “cold” colors to bring objects forward or push them back. Yes. Great. You can guess the hot and cold colors. Create the illusion of depth any which way you can. The same progressions of value that work for inkers work for colorists. Value is the colorist’s most powerful tool, too. If you’re ever looking at a panel inked by one of the greats—Williamson, Woody, Giordano, whomever—and you wonder why they haven’t engineered the illusion of depth as well as they might have, I’ll guarantee you, it was one of two reasons. Either they were obliged to follow the indications of a penciler who hadn’t thought it through, OR THEY WERE IMAGINING THE PANEL IN COLOR, seeing it their minds’ eyes in color. Thinking about how Marie would exploit the darks, textures, tones and lights. 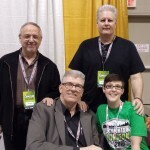 Or Tatjana Wood, or George Roussos, or Glynis Oliver, or Klaus Janson, or Max Scheele, or JayJay Jackson. Think about the Alex Ross books you’ve seen. Ever had any trouble “reading” a single panel? I had a guy named Dan Green working for me at Marvel. Inking the X-Men. I tried to explain using value to create the illusion of depth. No good. He kept bringing in stuff that looked like a Rorschach test. Great body of technique, brilliant hands, total control of the tools like you couldn’t believe. But I think he’d heard editors and artists say, “You must spot your blacks” too many times and I couldn’t get him to believe that wasn’t the goal at Marvel, that I really wanted depth and clarity. I kept saying, “Dan depth, depth, depth.” He’d look at me like I was crazy. And he’d bring in these elegantly crafted Rorschach tests. Finally, one time, he showed me a painting he’d done. Who knew he painted? It was great. Miles and miles of depth, brilliant use of value (and every other tool at his command). I said, “Dan, what you’re doing on the painting, do with the ink.” He says, “Oh, so THAT’S what you want!” [laughter] After that, he got it. Brilliant artist. He was used to editors and other people who didn’t know what they were doing telling him stuff because it sounded good to say, he just didn’t register what I’d been saying. He’d heard so many people say, “Well, you have to spot your blacks. You have to make an attractive abstract pattern with your blacks”—even really good people, who you’d think were unquestionable!—that this superb artist assumed what they were saying was what the peculiar little comic book business required. Next thing you know he’s bringing in inking done the way he painted, with depth and clarity. I suspect his training and instincts would have led him to always do so if he hadn’t been given bad intel. That was in ancient days. Now, it’s almost all computers. Here are some examples of good coloring, or because these are modern times, good painting. I’m still waiting for Marvel to sue me for using a Captain America story to illustrate good storytelling…. …and I’m fearless, or nuts, so here are images I borrowed from a book called Dinotopia , I know the people and they were kind enough to let me use them. So far. They’re great. They show you the principles of creating the illusion of depth through coloring better than any I’ve ever seen. Just look at them. You don’t need me to say anything. Separate planes, try to create an illusion of depth. No matter what you do it’s a flat surface. There’s no real depth there. You’ve got to create the illusion of depth. I’ve shown you the tools, the things you can use. If you succeed in creating depth, the image becomes clearer, it tells a story more clearly. Serve the story. The point is we’re not cameras. We need not be rigidly literal. We’re trying to tell a story. I’ve heard people say, “Well, but that wall would really be a certain color, and it doesn’t work with your depth thing.” Yeah? Well, look at the wall here. It is a certain color, it has been painted a certain color. But look at where the light is hitting it and where it’s less well lit. Same wall, same paint, what’s the difference? Light. You’ve got more light hitting it here so it looks lighter, you got less light hitting it there so it looks darker. Fine, then you’ve got a 30 percent differential, and you’re still honest. You got 30 percent artistic license. When Ditko drew Spider-Man against an open sky, the non-red parts of his costume were mostly black. When he drew Spider-Man against a darker background, he “opened” the non-red parts so they were mostly blue. Get it? And I loved when he would show only the red in blackout situations. But I digress. One more thing. Look at night scenes in comics today, and generally the idiot—I didn’t say that. I retract that. Anyway, okay, the charming colorist will color everything dark, because it’s night. Have these people never seen a movie? Any trouble seeing clearly what’s going on in a night scene in a Cameron film? Any problems or confusion in T2? See everything okay? By the way, the scene with Cap breaking the crooks out of jail was a night scene. Any trouble reading it? You’re here to tell a story. First priority. By the authority vested in me, I grant you all an artistic license. Tell the story. And, colorists, buy Dinotopia, read it, live with it, learn from it. P.S. Two words of advice that will tremendously improve your coloring—WHITE SPACE! Leave lots of white space. Use white as a color. A lot. Do it. You’ll thank me later. WHITE SPACE! I may not have been clear. We did exactly as you said, adding color on stats. We didn't colorize film. We made stats from the film. …Frack me. It never occurred to me that you might be taking shots of the finished work and then colorizing the film! I've done a little of that in my day, but not enough to where I'd have thought that was the trick being employed. My best guess was that you'd used stats of the originals and used colored pencils and some fine-tipped paint brushes to add color where color could be added. Guess this as a case of being petty close and yet a mile off target. I know of no one who uses Zip-a-Tone these days. The Price was done B&W with ink and wash. I wanted to publish it in color. I didn't invent a new process, I just resurrected the ancient process called photo tinting. Remember that? Black and white photos with color washes applied over them? We shot slightly greyed-down stats of the art (or film), colored over them and punched up the blacks where necessary. Worked pretty well. Archie was amazed. And he, like me, was old enough to remember photo tinting. He quickly became a master at directing the process and innovating with it. 1) Does *anyone* use Zip-A-Tone anymore? From what I've gathered, since the stuff is hard to find these days, most artists use Photoshop to fake ZAT effects by taking a repeating tiled image and squashing/transforming/mutilating it until it looks somewhat like something you'd find on a sheet of ZAT. One artist I'd asked about this recently online said the only artist he knew of who still used the stuff was reportedly Keith Giffen, and he wasn't using much of it for that matter. 2) A long, long time ago, you took Jim Starlin's The Price and reprinted it under the Epic line. At the time, you'd hinted that in order for Jim's finished art to be presented in color, you had to invent a new process for colorizing art that had been penciled, inked and otherwise finished in B&W/Greyscale. However, in the near three decades since The Price was reprinted, I've yet to see details of what that process was, and how it all worked. In an e-mail conversation with the late Steve Gerber back in 2004, Starlin's Dreadstar came up, and through several back-and-forths we both recalled The Price reprint, but neither of us could ever find anything out about your process. Care to give the details on that one, or is it still in your opinion "too proprietary to discuss publicly"? Thanks for sharing your father's story. I knew he had been "called off to war" (FATALE #1, "My Word") and was a steelworker but this intermediate period was a revelation to me. If you ever publish your autobiography, I hope you can elaborate on your parents and how they shaped you. Your father's encouragement and the Gnagy kit he bought you set the course of your life. And you navigated life with class because of the "values and courage" that you learned from your mother (again referring to that "My Word" column). Too many people look down on blue-collar jobs. They don't understand the satisfaction of looking at a product and knowing, "Hey, I made this." Your father knew that. I've been to NYC several times but have never visited the Statue of Liberty. If I climb the stairs, I will think of your father. Your Gnagy lapboard was part of comics history. Karate Kid, the Parasite, and the Fatal Five were "born" on it, and it supported your drawings of Superman, Batman, the Legion, your advertising work (more on that someday, I hope) … and later the words of the Avengers, Daredevil, and Ghost Rider. What a shame that it's no longer intact. My father wanted to be an artist when he was a young man, just out of the army. He took classes for a while at the Art Institute of Pittsburgh, but the need to make a living put an end to that dream. He couldn't make ends meet working nights and going to school days. Universal-Cyclops Steel was hiring, so he took a job in their Bridgeville plant. He remained a steelworker till he retired. And was proud to be a steelworker, by the way. ASIDE: On one of his trips to NYC, I took him to the newly refurbished Statue of Liberty. We took the stairs to the observation deck. From the stairs, you can see the entire inside of the statue, including the steel frame that supports it. My father, seldom given to expressing emotion, did it twice on that excursion — once, as we were approaching Liberty Island when he quietly said how glad her was to see the statue when he was returning home after the war. And once as we were climbing the stairs, he pointed and said, "I made that steel." Back to your actual question — once in a while, my father would draw a picture for my sister and I. Usually airplanes. Sometimes a ship. He encouraged us to draw. He bought us each a Jon Gnagy Learn to Draw kit. ASIDE: The masonite lap board that came with that kit served me well. Every word I wrote, every drawing I made was done on that board till the early 1980's. When I retired that tattered, worn out board, Joe in the Marvel mailroom made me a new one. I kept the original — for nostalgia's sake. But in 1994, it got broken. Too bad. I didn't know your father had an art background. I assumed you got the Loomis books when you were taking classes at Carnegie Mellon. Did your father teach you to draw when you were a child? Sorry about the delayed reply. JayJay has been working on a comics printing overview, and I thought she was covering flexograph. She is, but hasn't finished her guest post yet. If she doesn't soon, I'll talk about it. It's an interesting story, I think. I was the one who created that list and included Loomis. I have a copy of Figure Drawing for All it's Worth from 1946 that my father bought when he was going to art school. I learned a lot from that book. The other Loomis books are great, too. There is a really great section in "Creative Illustration" by Andrew Loomis that talks about tonal plans using black, white, a light gray, and a dark gray. I think it does a good job of breaking down the theory of design and clarity that you're talking about here. I think it's a good idea for artists to think in terms of tonal plans when creating thumbnails, or roughs. I don't know if Marvel still does this, but Loomis was one of the authors recommended for aspiring artists. After bombarding your office years ago with submissions, I received a reading list that included Loomis. I'm definitely a better artist for the advice. Thanks! We used "Paynes Grey" for Y2R2B3. More of a steel grey than Y2R2B2, which was a very neutral light grey. Not one mention that everything in modern comics has to glow in some way shape or fashion… I'm glad! The increased color palette offered by computers has resulted in too many colors being used that are not commonly seen in nature. I miss the reduced color palette. More is not always better if a colorist does not know how to use the extra options available. Y2R2B2 was also known as "Batman" gray, since that was the way it was created on interior pages. Sometimes the 25% yellow didn't print properly (or hadn't been laid in by the separators), resulting in Batman's "gray" looking light-violet instead. 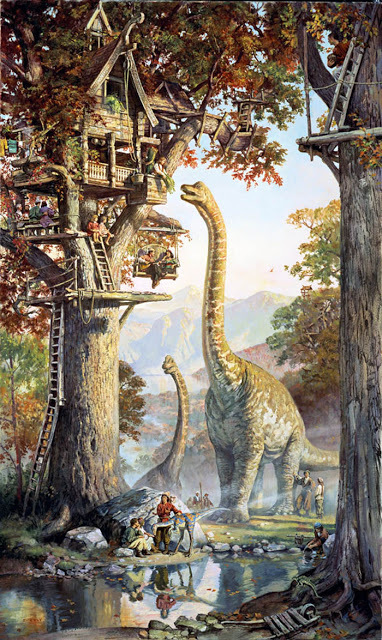 Dinotopia is indeed great – lovely to see those panels! This was a really interesting read for me, as I knew relatively little about the process. Looking forward to JayJay's guest blog on this topic when it comes out. By the way, I never got the Valiant comics back in the day but have been picking them up at my local shop with the new Dark Horse titles. I have to say, the coloring on those Valiants is really extraordinary. I don't think I've ever seen anything look quite like it. I hope this isn't just me seeing things, haha – was there some special process used? I recall reading something about that one time. I guess digital coloring is a step forward for the industry, but give me the old coloring over the computer look. I learned to look at comics that way, I guess, and that's how I like them. thank you Mr. Shooter, for bringing your lecture series to your blog. this is the closest anyone has ever brought me to the the masters and the closest i'll be able to get to know what you know. you've filled in a lot of the blanks as to "WHY" we do things, and i intend to use it to improve my skills and incorporate into my own work. thank you for all you bring, your knowledge, talent, fighting the good fight and the years of inspiration you gave me. most of all thank you for beng you. 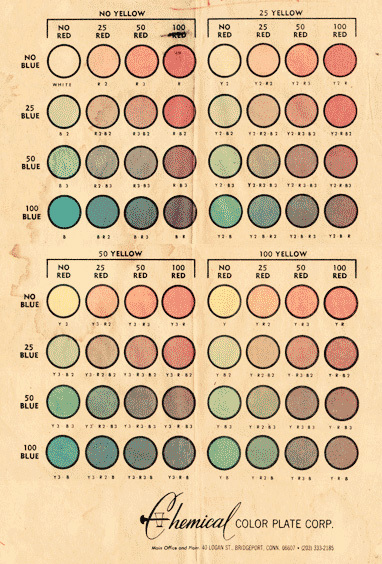 I've long wondered what the 64 colors of old school coloring were. Thanks to JayJay for the chart! Looking forward to her guest post. As I read your posts, I realize how much I *see* but do not *perceive*. The three-tier color hierarchy for heroes, villains, and civilians was in front of my eyes for four decades and I just didn't notice! 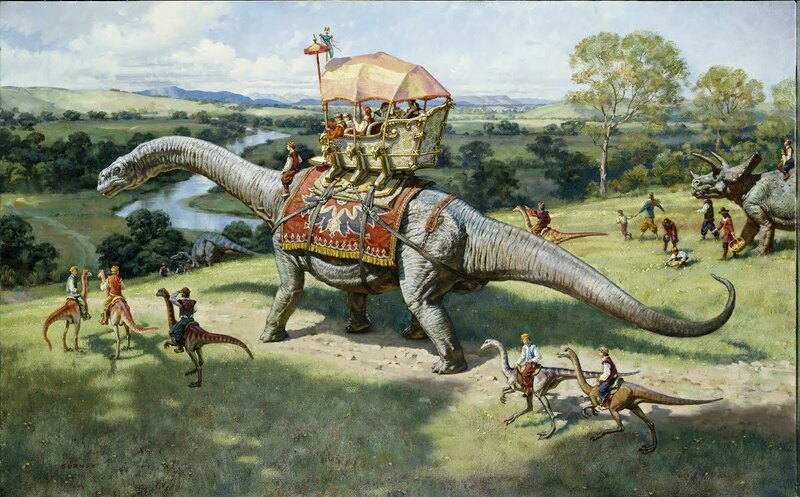 I've owned DINOTOPIA for 18 years but until you mentioned it, its true value as a teaching tool never even occurred to me. Before Photoshop, I was into what I thought was realism. I would have said, "Well, but that wall would really be a certain color, and it doesn’t work with your depth thing." The result was backgrounds that competed with the foregrounds. A collage effect. High contrast cutouts atop other high contrast cutouts. Hard to read. Later, I used Photoshop to blur backgrounds. Easier to read, but still dodging the real problem: color. I was still trapped in a camera mindset. Now you have freed me. I would have once dismissed artistic license as artifice, as an excuse. Now I see it as a tool to convey a story. Fiction. Not the nonfiction captured by cameras. White space is an option absent in the real world where there's endless detail in the background. What do you think it's best used for? Highlighting something by placing in a void free of visual noise?